Have you ever driven along the nationale roads of France profonde and seen faded adverts painted on the sides of buildings? They represent a France seemingly long gone although they date only as far back as the twentieth century, and trace the development of both motor vehicles and the French economy. A part of French patrimony, they are frequently at peril from the destructive improvements of the twenty-first century. 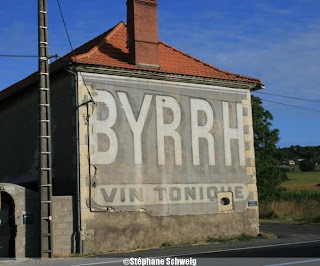 One of the most iconic of French wall-painted adverts is for Byrrh. Have you ever tried this aperitif? Do you know that it's still being made? In the same place? In Thuir? We decided to devote Sunday morning to a visit of the Byrrh factory. It was absolutely fascinating. The tour takes you round the old parts of the factory which are no longer in use, except for some of the large old casks which are rented out by the Tourist Office to companies such as Dubonnet. The drink was originally created in 1873 by the Violet brothers who took advantage of the growth in wine production to set up shop in Thuir. They were drapers, but developed a tonic that contained quinine and tried to sell it as medicine. The pharmacists of Montpellier took a very dim view of these upstarts trying to get a foothold in their lucrative tonic business, and threatened them with lawsuits galore. They decided it was a battle they couldn't win, so reduced the amount of quinine in the tonic and made it into an aperitif instead. What marks them out from the competition at the time is the way they developed the business until Byrrh was being sold all over the world. One of the ways they marketed the drink was to hold a competition to paint an advert for Byrrh in 1903. Over nineteen hundred artists took part! There was an exhibition of some of the designs, in that lovely Art Deco style of the time. One of the entries that didn't win. Love the louche sensuality. We also saw how avant garde the brothers were regarding their employees. They had women in the workforce, including one in management, and set up a pension scheme, and paid leave. The almost highlight of the visit was seeing the largest oak cask in the world - 12 metres in diameter, 10 metres high, weighing 17 tonnes, and holding over a million litres. It was designed to better the previous record winner which was a German cask that only held 900K or so litres. There was even a little railway station for deliveries designed and built by no less than Eiffel himself. I could just imagine the little trains rattling in carrying the precious spices used to give the drink its distinctive flavour (orange peel, cocoa beans, elderflower, coffee beans, camomile, etc. ), and out again with cases of the finished product to be sent all over the world. Unfortunately, the drink fell out of fashion after WWII, and in 1977, the company was bought by Cusenier, and later became part of groupe Pernod-Ricard. and the version 'rares assemblages' which was similar to port. Our favourite was the Grand Quinquina, the original tonic, and very lively it is too, so my DB bought a bottle. I'm hoping that Byrrh will make a come-back, as have done sherry and cider. Visiting the factory was definitely worth it. The tour was well done, with lively presentations, and an interesting guide; the story was worth telling, and the dégustation a delicious way to end. If you get the chance, do go along and take the tour. What with me and my mead and you and your Byrrh, we could start a new fashion in unusual drinks! Love the story behind this, the competition etc. The story of the company was amazing, how they went from nothing to one of the most successful companies in France of the twentieth century. Talented guys, those Violet brothers. I have noticed Byrrh signs before on the road, but haven't seen many around here. I did NOT know it was still made, though, although I'm not much into that sort of apéritif so I don't scour the aisles or the department at my caviste's. Loved this post! PS Blogger published your comment twice so I deleted the double. LOVE the adverts and posters! I don't know Byrrh either, but I'll keep an eye open for it. Our locally-made aperatif is pommeau and we enjoy taking visitors round a nearby domaine which produces calvados and pommeau.